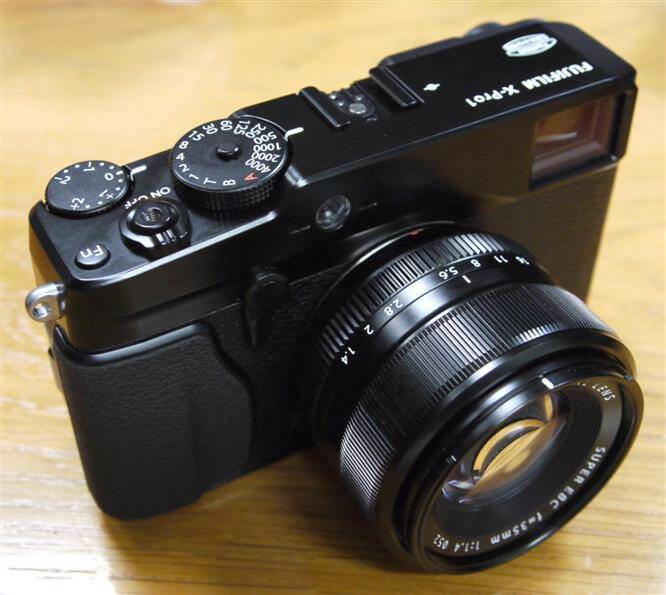 Updated 13/01/12: CES 2012: We go hands-on with the new Fujifilm X-Pro1 mirrorless camera and three new prime lenses. 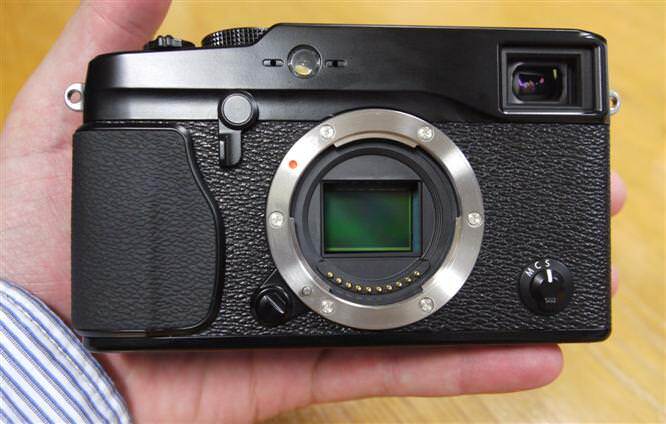 The new Fujifilm X-Pro1 is the new mirrorless camera from Fujifilm and introduces a new X lens mount and 16 megapixel APS-C sized sensor. The sensor features Fujifilm's brand new "organic" filter array designed to reduce moire and increase performance at higher ISO settings. 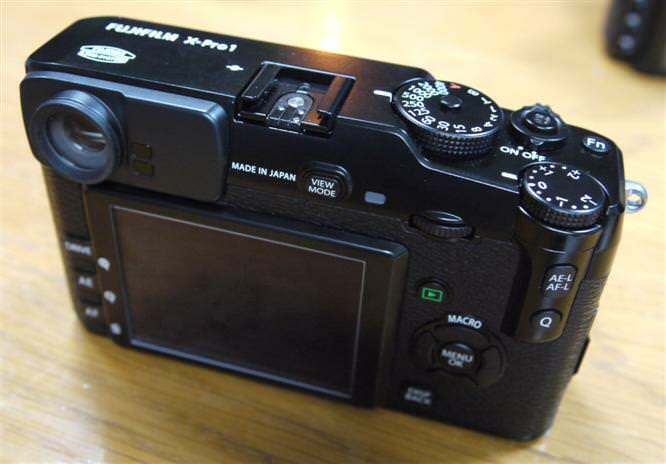 The camera features a matched optical viewfinder that is designed to be used with the three new prime lenses, while future lenses will need to use the live view on the screen. The camera features a front grip much like the original E-P1 and the camera's size and build quality is very reminiscent of the Olympus PEN E-P3, however with a larger, heavier body. 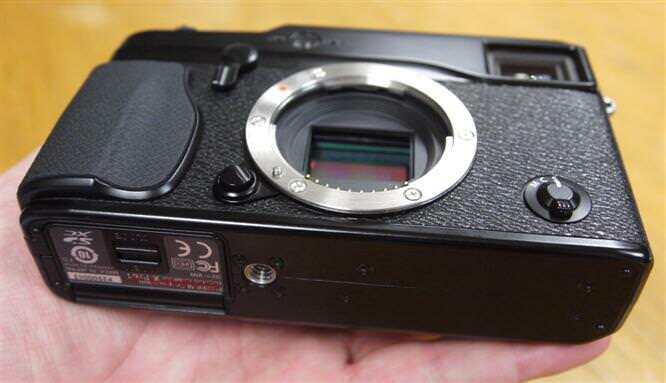 Handling - The bottom features a metal tripod socket and the battery / memory card compartment much like the Fujifilm X100. Buttons - The camera features a number of buttons and dials giving you manual control over shutter speed, exposure compensation, focus etc. A new Q button giving you quick access to settings on the back screen, like a short-cut menu so you don't always have to go into the menus to change settings. Menus - The menus have been updated to spread the options over a number of separate tabs to increase access to settings. The design gives the cameras menus a much clearer and more logical appearance. OVF / EVF Hybrid Viewfinder: The viewfinder lets you switch between an optical viewfinder or an electronic viewfinder, with the optical viewfinder using an overlay so you can still see shooting options. We show a quick demonstration of the viewfinder above, switching between the two modes. Prime Lens line-up, from left to right: 18mm f/2, 35mm f/1.4, 60mm f/2.4 Macro. Lens features aperture ring for traditional camera feel and quick settings without having to use menus. Price TBC. The price is expected to be in the premium mirrorless camera market between the NEX-7 and Olympus PEN E-P3, body only with the lenses available seperately. 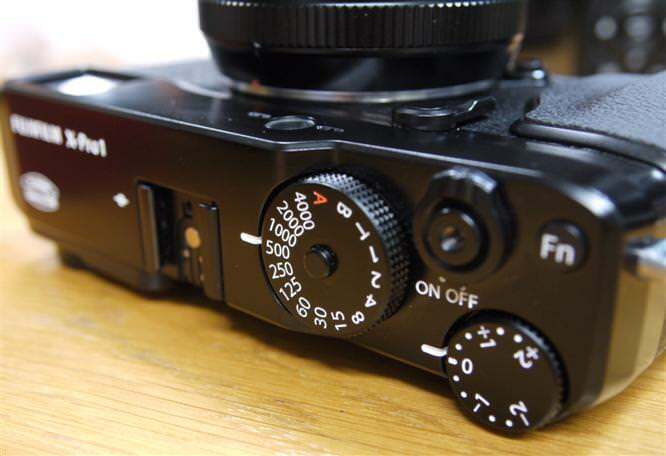 The Fujifilm X-Pro1 offers the same size sensor as APS-C Digital SLRs, with a 1.5x crop factor and a new lens mount. The lenses are designed to be prime lenses and feature a matching premium price tag to go with them, expected to be around £500 each. Another unique feature of this camera is the classic camera styling but with a built in Optical/Electronic viewfinder, something no other mirrorless compact camera can offer, although the optical part only works with these prime lenses, when other lenses are released then you will need to use the EVF. The new sensor design and completely new filter design aimed to improve low noise and colour detail without moire will be interesting to test. We will have to see sample photos before we can comment. It's certainly an interesting product and it will be interesting how the market responds. 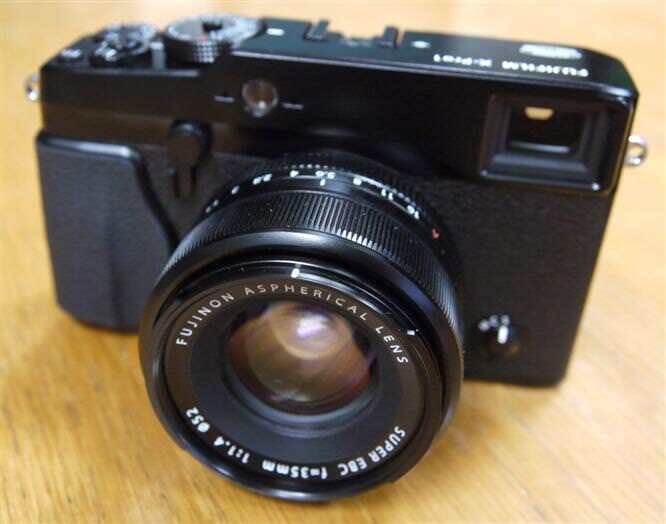 Fujifilm has done extremely well making premium compact cameras in a crowded market, such as the Fujifilm X100, with few other premium cameras, however the mirrorless market is fairly well served by premium cameras and it will be interesting to see how well they sell. 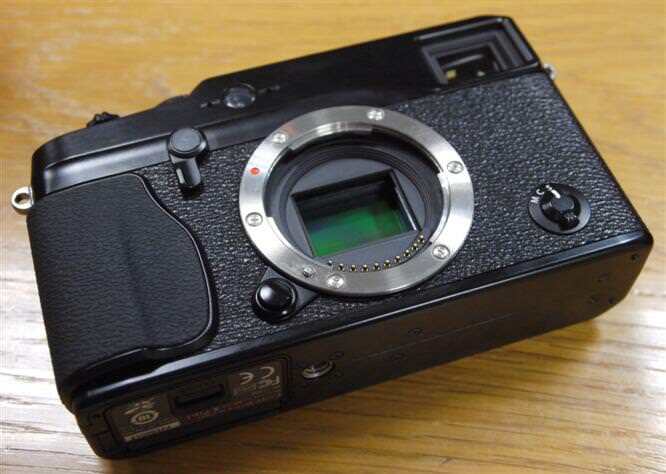 I'm just not sure where Fuji intend this camera to be in the market place. They more or less hint its towards the Pro end of the market with suitable prices. 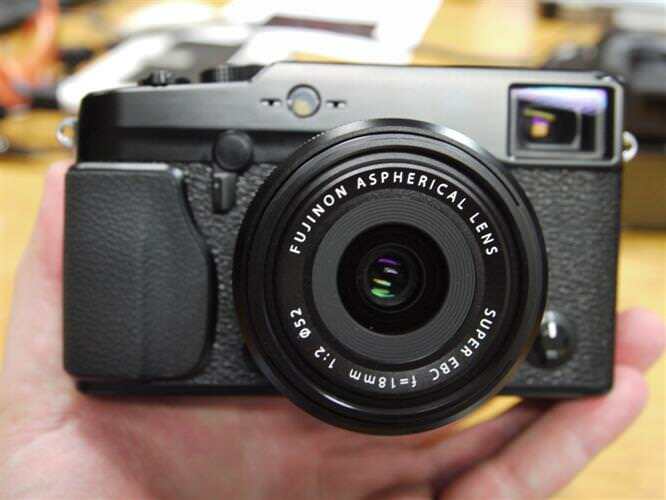 Its almost as if they are giving us a Leica alternative. There is no doubt this camera is a cracker and so are the 3 primes launched at the same time, but compared to the X100 and X10 its quite a bit bigger and it would be stretching the term compact or in the old days 'Range Finder'. My Panny G3 looks smaller. I have always admired Fuji image quality especially Jpegs from the S5-Pro and its my considered opinion that they are up there with Olympus for super Jpeg quality. I think this camera will appeal to the enthusiast section of the market with one or two Pro's jumping on the band wagon as well. Its a heck of a lot cheaper than a Leica but is it a good alternative to a Leica? without doubt, yes. Its still pricy if you intend to build a system round it but probably no more so than your average DSLR kit. [quote]Its almost as if they are giving us a Leica alternative. [/quote] Right on the money Peter - certainly as I see it. I want one. Quote:Its almost as if they are giving us a Leica alternative. Right on the money Peter - certainly as I see it. Question: What recorded Bit depth are the Raw files? As the Canon G1X is 14 Bit. Question: What recorded Bit depth are the Raw files? As the Canon G1X is 14 Bit.